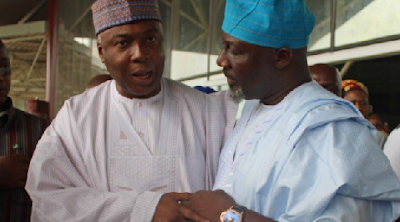 Senate President Bukola Saraki says efforts made to recall Dino Melaye, senator representing Kogi west, should have gone into more “important things”. Saraki said this after Ike Ekweremadu, deputy senate president, contributed to a motion moved by Melaye on the recall process, The Cable reports. eject him from the upper legislative chamber. The Independent National Electoral Commission (INEC) has already fixed July 10 and August 19 for the verification of signatures on the recall register, saying the outcome of the verification would determine whether the commission would proceed to conduct a referendum. “As they say, 10 years is no joke in leadership. The deputy president of the senate has explained the processes. Let the process speak for itself,” Saraki said. Earlier, Ekweremadu compared the process of recall to impeachment, saying the national assembly made it strict to avoid abuse. He said debating the matter at plenary would amount to waste of “precious legislative time”. “What is happening in Kogi, in respect of Senator Dino Melaye, as far as this constitution is concerned, it is an exercise in futility. They are just wasting precious time because the constitution is clear on what should happen,” Ekweremadu said. “It is possible that the attorney-general of Kogi state has not advised them properly. If he had done that, I am sure they would have applied their time to more meaningful ventures in the state. The process of recall is the equivalent of impeachment of executive positions. “To avoid the abuse of impeachment, they made it very strict, provisions and procedures were made on how impeachment can take place. That is why people are not taking that route of removing governors by impeachment. “In 2010, this parliament amended the constitution regarding section 69. It states that the number of those who are supposed to have requested his (Melaye) recall are supposed to line up somewhere in Kogi, while Melaye and his lawyers and each person would verify their signature. Earlier, Melaye reiterated that names of dead people appeared on the recall register sent to INEC. “The total score of both valid and invalid vote is 118,000 but my governors and his appointees in four days claimed they got a signature of over 188,000. They got INEC database of registered voters and copied in one writing into a recall register and forged all the signature,” he said. “As I speak to you over 120 dead certificates issued by the national population commission and these people relations and families have sworn to the affidavit and these certificates have been deposited. A chief magistrate court sitting in Asaba, Delta State, yesterday, sentenced one Onyemachi Alor to 11 years imprisonment without an option of fine for conspiracy and child stealing.